When we city people take the occasional drive in the country to clear our heads of the tumult of urban life, it's easy to drive by the fields planted in long, symmetrical rows of various crops and think only of how pretty they look or of the food they'll produce. But this land also has a hidden life not visible to the casual passerby, one that makes our ordered urban lives seem placid by comparison. 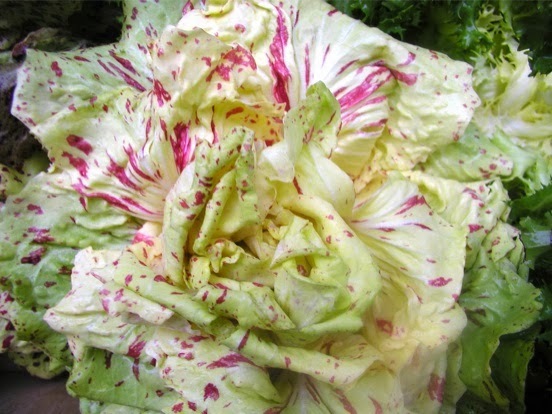 It's the reason I love the essays of contributor Anthony Boutard of Ayers Creek Farm, who gives glimpses into what's really going on between those neatly planted rows. The bobcat, Lynx rufus, is a furtive spirit, more often observed by what is left than its actual presence. Our cur, Tito, picks up the cat's scent and has developed the sensible habit of demanding human company and looking over his shoulder when he goes out before bed. He is the same way when the coyotes hunt close by. Despite millennia of domestication, he retains the survival instincts of his ancestors. 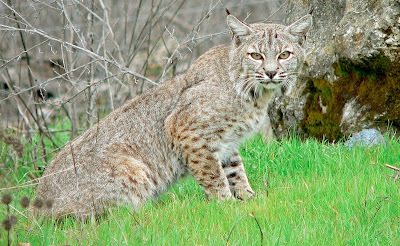 The average bobcat adult weighs about 20 pounds (9 Kg), though individuals can approach 40 pounds (18 Kg). Their diet is mostly rodents, though they can kill much larger animals if the opportunity presents itself, even deer. The bobcats west of the Cascades are distinctly darker than others of the species, and are recognized as the subspecies fasciatus. We first saw the bobcat in September hunting in the draw, recognizing its feline gait and stalking mannerisms, an animal obviously leggier and taller than the feral tabby cats that survive being tossed out of passing cars as kittens by careless souls, but not a positive identification without seeing it face-on. Later in the month, Zenón went out at dawn to pull rocks from a newly cultivated field and saw "un gato grande" hunting voles in fresh ground, a more certain sighting. Our neighbor Darwin, a veteran hunter and outdoorsman, made the positive identification in late November when he turned a corner near his blind and came face to face with the cat. As he described it, they both paused, staring at one another for a moment to catch their breath, before the cat bounced away into the canary grass. In the twilight of Christmas morning, we watched the bobcat lope across the field and down the road towards the creek, quarry in its jaws. Evidence points to its denning at times in the briars near the pump station, a hunch with which Tito, his hackles high, concurs. Animals that are active during the day are described as diurnal, those at night nocturnal. Crepuscular animals are active at twilight, the edges between day and night. In habitat as well habit, the bobcat is a species that thrives on the productivity of edges. As we have described previously, we are situated where the Tualatin Valley is at its narrowest between the Coast Range and the Tualatin Ridge, providing a short corridor between those two forested foothill habitats. The farm itself is a mosaic of cultivated fields, oak savannah and wetland, offering a lot edges between these ecotypes. The effect of our "edginess" is best seen in the variety of raptors that hunt on the farm. Kestrels, harriers, red-tail hawks, barn owls and great horned owls all nest on the farm, osprey and bald eagles nest in the valley and hunt here. Migrating cooper's hawks, sharp-shinned hawks, merlins and peregrines pause to fatten up during migration. Elk, deer, mink and cougar, among others, use the farm as a path between the foothills, but they pass quickly and with purpose beyond our boundaries. Chicories, you will be missed. The bobcat is likely a visitor as well, a youngster seeking its own territory. That it has lingered so long explains in part why we have so few chicories this year, even though we doubled our planting. We adhered to our pattern of crop rotation without considering that the planting bordered part of the farm that was in fallow for the past year. Last spring, the population of meadow mice (voles) was low so we paid little heed to them in our planting during the summer; it was an understandable but unfortunate oversight. Unobserved by us, the population in the fallow field skyrocketed over the summer, and there are few crops so well suited as chicories for feeding a hungry hoard of voles through the cold months. By September we sensed the problem and did everything we could to salvage the crop to no avail. Wave after wave of voles have kept the raptors well fed, and the surplus rodents kept us in the bobcat's hunting territory. The ground is covered with holes barely a foot apart, and the cold snap made the little rodents that much more ravenous. Without a bounty of fat, chicory-fed voles, the bobcat would probably have moved further into the foothills where there is better cover and a supply of prey, and less competition from the coyotes and raptors. In the popular literature, healthy predator populations are supposed to stabilize prey populations, creating a population equilibrium and thus providing a service to humans. Yes, predators are valuable components of a healthy ecosystem, but it is important to understand that population dynamics in prey populations are driven by many environmental factors. Disease, weather, food and cover availability, for example, all have a far greater influence on rodent populations than the predators. Face it, predators are, like us, consumers rather than mere service animals. There is parallel with farming in that no matter how good we think we are as farmers, the weather and other exogenous factors ultimately determine our success. We can plot and plan, but the weather and vole populations defy anticipation for both bobcat and cultivator. Heeding Eric Idle's advice, as you grumble about the sloppy farmers who failed to deliver your chicories this year, maybe it will help to know that a leggy, elegant bobcat is meting out some form of retribution. And a host well-fed raptors as well. It is, after all, a backhanded compliment to our farming efforts that so many other animals thrive on the fruits of our labor. Top photo by Calibas from Wikimedia Commons. 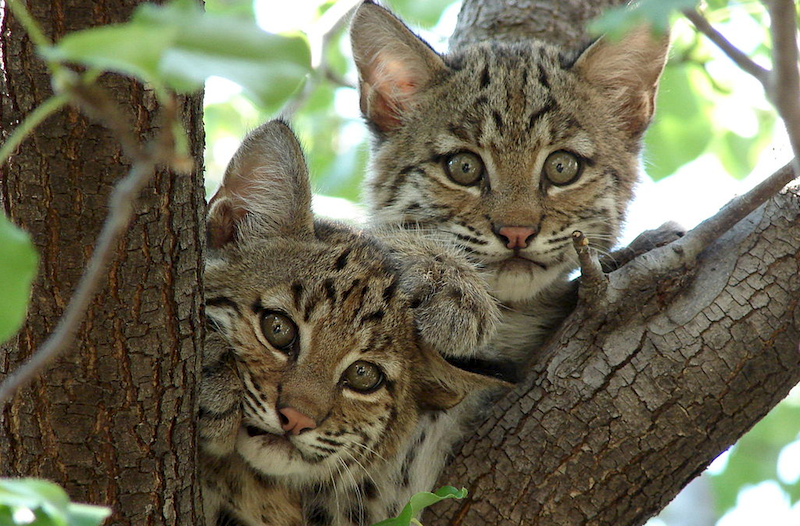 Photo of kittens by Summer M. Tribble from Wikimedia Commons.